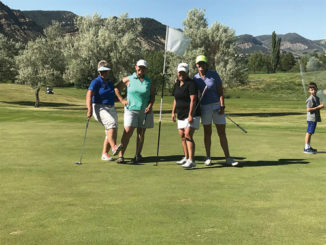 MEEKER | The Meeker Golf Course hosted the 2018 Women’s and Men’s Club Championships Saturday, Aug. 18. The championships are the wrap-up to summer club ball that began the week of May 8. This year 22 women and 46 men signed up to play on a weekly basis, Tuesday and Wednesday evenings. A total of 30 people competed in the tournament, seven women and 23 men. Mindy Finley took First Gross for the women and Christy Atwood took First Net honors. Men’s play had two flights and ended up in a playoff between Lex Collins and Nick Burri with Nick winning on the third playoff hole. 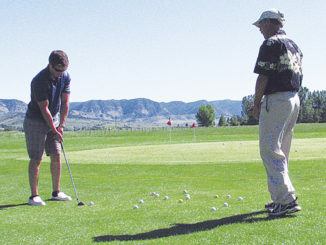 Meeker High School graduate and United States Air Force Academy cadet Nate Bradfield spent part of his recent leave at the Meeker Golf Course, getting a chipping lesson from local pro Jim Cook. MEEKER I Local golfer Lex Collins recorded his fourth career hole-in-one at the Meeker Golf Course on Saturday after the Ladies’ Deerfly.